With a dull overcast day and a brisk onshore breeze our initial plans to visit some of the more out lying dive sites off the Farne Islands had to be changed, as we headed out in the club RIB powering up and over the short chop. After a rapid rethink we opted to have a dive on the East side of the Caller’s reef. This reef provided a degree of protection from the SE swell. 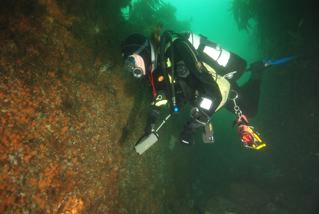 Dropping into the water Richard, Fiona and Nick followed the reef line coming across the remains of the slate wreck. Nothing physically now remains of this lost vessel other than it cargo of cut slate tiles. The vessel itself must had come to rest against the reef before eventually sinking and settling upright on the bottom, as the cargo appears to be still stacked in quite an orderly fashion in a neat lines. Kelp clings to the top of this lost cargo with deadmen’s fingers clinging to the edges of the piles of slate. Moving on we came across a very scenic but narrow gully that cuts through the Caller’s reef before opening out into a larger area of further gullys and large rocks covered with life. For many years she rested on the seabed, upright and largely intact. More recently however efforts to salvage her cargo have resulted in this wreck being ripped apart. Whilst not the dive she once was, the Somali is still worth visiting. The area around her engine room is particularly impressive with several huge boilers and the remains of her massive steam engines still very much in evidence. 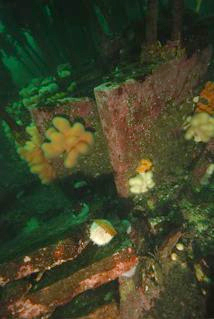 The wreck also acts as a magnet for marine life with numerous large Pollack and Cod being observed hunting above the wreckage. Surfacing after 15 minutes we found ourselves in quite a rough area of water with the RIB barely visible on the other side of the reef. Here the usefulness of carrying a folding high visibility flag came to the fore, and fortunately it soon succeeded in attracting the attention of those left on the RIB. After being picked up it was decided that with an increasingly rough sea we would head over to the more sheltered waters on the South side of the Longstone. 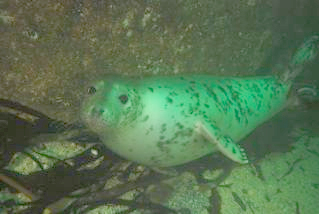 Here Bill and Andy enjoyed a gentle drift dive along the wall exploring some of the gullys that appear to be used as sheltered nurseries by the resident seal population. For the final dive of the day it was just short journey down to staple island for a quick tour of the wreck of the St Andrea off Staple Island . 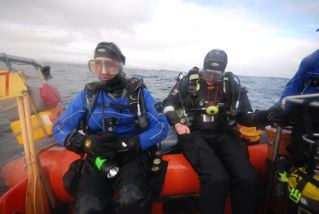 Once all divers were safely recovered it was just a short hop back to Seahouses harbour. 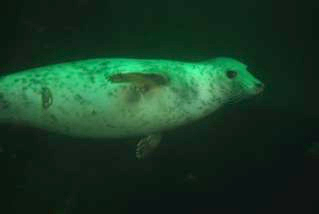 Another interesting and enjoyable day diving out in the Farnes.